In our ocean-shaking volcano issue, witness the explosive birth of…Patrick's new house?! It happens in "Guest to Pest" by Scott Roberts. 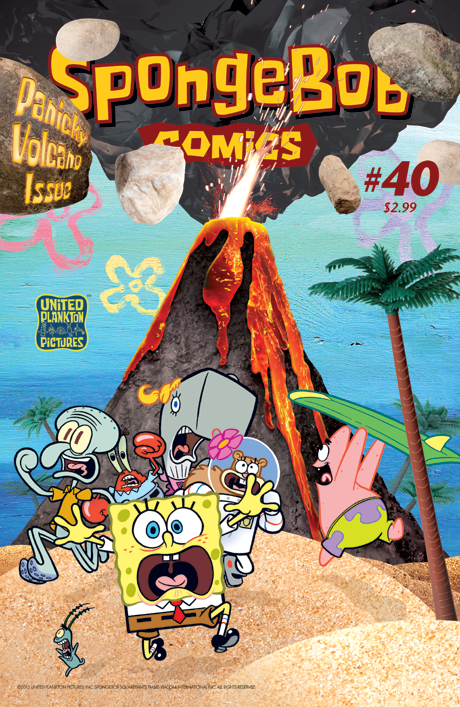 In "Magma Morons," SpongeBob explores a volcanic island with a secret–courtesy of Kaz, Vince DePorter, and a big photo spread of a “real” volcano! Plus, in "Formula None," SpongeBob goes on strike when Mr. Krabs replaces the Krabby Patty ingredients with artificial filler! Also, facts about undersea vents by Maris Wicks (Batman '66, Primates) and Dave DeGrand's tale of the weirdest-shaped toe blister in the history of Bikini Bottom!